If the unexpected occurs, do you know if your assets will be sufficiently protected? 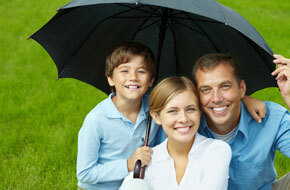 Umbrella insurance provides expanded liability insurance beyond your baseline insurance. This coverage insures additional liability coverage above the limits of your homeowner's, auto, and boat insurance policies. A personal umbrella policy will provide an additional layer of protection for your assets if there's a serious auto accident or accident on your property. It can also provide coverage for claims that may be excluded by the primary policies including invasion of privacy, libel, false arrest or slander. An umbrella policy is strict liability coverage that expands the coverage stated by your other policies. The term "umbrella" is used because it covers liability claims from all policies underneath it, such as auto insurance and homeowner's insurance policies. Umbrella policies are sold in increments of one million dollars. A personal umbrella insurance policy from Tom Collins Insurance Agency will protect your wages, your home, your investments, your vehicles and your boat.